A good day begins the night before. I think we all know this. A little preparation the night before makes our morning less frantic and much more likely to be the beginning of a good and productive day. Taken to the next level, creating an evening ritual finishes our day on a pleasant note, as well as setting ourselves up for the next day. The kitchen is cleaned right after dinner. I make myself (and David, if he wants one) a cup of tea or sometimes pour a glass of wine. I go to our library where I often listen to an album or two on the stereo while reading a book or checking Facebook on my phone. Before going upstairs to bed I feed the cats, turn off the light in the aquarium, straighten up afghans and pillows on sofas, turn off all lights downstairs and adjust the thermostat. This is where my routine breaks down. If I haven’t turned off my computer before my evening teatime, I’m way too likely to get sucked into Facebook or email or working on something for this blog. I’m also in a bad habit of looking at my phone when I get in bed. And of course, we stay up WAY too late virtually every night. Remove all the decorative pillows from the bed, turn back the covers, spray pillows with lavender linen spray, turn on bedside lamp, turn OFF computer. Plug in phone to recharge on opposite side of room from bed. Make hot tea or pour a glass of wine. Go to library or front porch if the weather is nice. Make to-do list for the next day. Journal. This is something I’ve been wanting to do for a long time. I think I’ll try the 5 Minute Journal. Turn off the lights no later than 11:30 p.m.
At least, that’s the current plan! 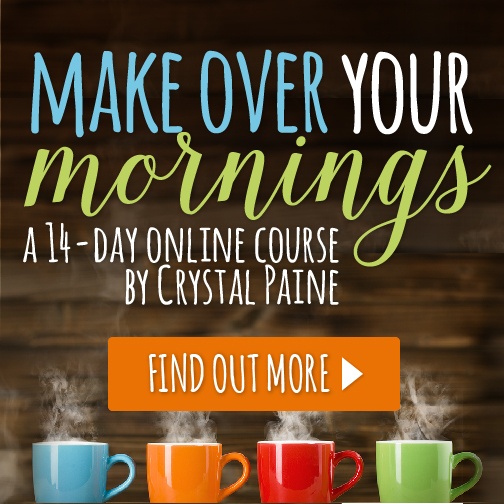 This morning I purchased Crystal Paine’s e-course, Make Over Your Evenings. I’ve done her Make Over Your Mornings course already and was very impressed. I plan to go through it again soon. I was pretty excited to hear that she would be doing an evening version because I really do think that’s the key to a productive day. I know I’m not getting enough sleep and it’s affecting my productivity. By focusing on the creation of an evening routine, including pleasant rituals such as a cup of tea, listening to music and journaling, I’m hopeful that I can get my days into alignment with my goal of creating a beautiful life. 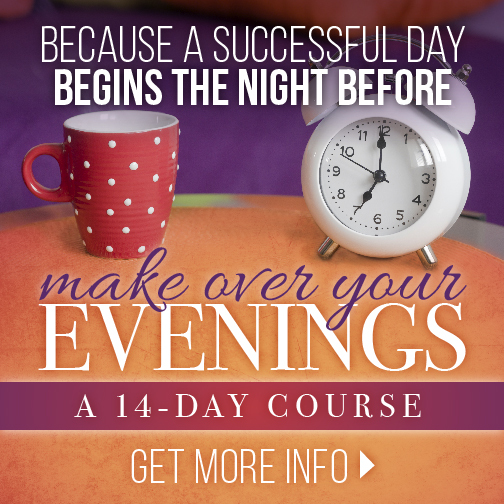 The Make Over Your Evenings course includes a PDF workbook and 14 daily videos for just $17 and I’m really excited to start the course. In fact, as soon as I finish this blog post I’m going to watch the first video. If you’d like to do this course, too, just click on the graphic below for more information and a link to purchase. So tell me, do you have an evening routine or ritual? If so, I’d love to hear about it. Leave me a comment and tell me all about it. *Check rodent food bowls and water bottles, filling or changing any that need it. *See if phones need charging. If they do, put them to charge. *Place bottle of drink on coaster beside bed. *Make sure there’s a CD ready to go in the CD player (either the next disk for the audiobook I’m listening to, the first disk for a new one, or – if I fell asleep before finnishing it last time – the disk I started listening to last time it was sleep time). *Head to the bathroom to brush my teeth, etc. *Go say goodnight to the rodent gang. Yes, I say goodnight by name to all of them last thing before I go to bed… It amuses my family, but seems to comfort them, since the degus especially become agitated if I’m gone too long having not said “goodnight” or “goodbye” to them (depending on whether I’ve gone to bed, or gone out). I’m not entirely certain how it got started, but it’s become my habit to say “goodnight” before sleep time, and “goodbye” before I go out, to each individual rodent. *Head to bed, putting my slippers and robe away as I go (if it’s cold enough that I was wearing them). *Turn on my audiobook (the stereo is beside the bed). *Climb in to bed, and get comfortable. Sometimes I’ll fall asleep before I get very far in the disk, sometimes I’ll fall asleep while trying to decide if I can be bothered to move to put the next one on, and other times I have to put another disk on when the first finnishes. I need an audiobook to listen to while going to sleep though. I think it’s something left over from when I was younger, and first my Mam would read to me until I fell asleep, and then – when I was older – I’d end up reading until I fell asleep most nights. I tell Shiloh goodnight or goodbye, too. 🙂 I have to read myself to sleep or listen to music. Yes, I do have an evening routine. I turn off my laptop around 9:30, then lie down on the couch with a book or magazine until 10:30. I plug my phone in to charge it. At that time, I feed the cats, put them in the basement for the night (they have their beds, cat boxes and a water bowl down there – we put them there at night, otherwise they disturb our sleep), come back upstairs to wash my face, moisturize, brush my teeth, turn down the heat (or AC in the summer) and take a calcium/magnesium supplement. Read again until about 11:15 – 11:30. I never check my phone once I go to bed – not again until morning. I knew from reading about it, that the light from phones disturbs your sleep, and I usually don’t sleep well as it is, so I don’t need anymore disruption! That’s what I’ve heard, too. I have eliminated other light sources in our room – for instance, we got rid of our clock radio years ago and now have a small, battery operated alarm clock with no light. The phone has just become a bad habit but one I’m going to break. Mine begins with taking meds, because one of them is for restless legs, and A bout of that can assure me of a sleepless night. At that point, i also put away my iPad and cellphone. For the same reason everyone has mentioned, the light keeping me awake. Then I do the nightly chores we all mentioned, feeding and putting the cats in “their” room, refilling the dogs food and water, brushing teeth, washing face, etc., then I decide whether I want to read, watch a 30 minute comedy or cooking show. One thing I realized is that I cannot end my night with any TV show that is anxiety producing. If I decide to read, I switch to my kindle, and I put a time limit on myself. At that point, when I head to bed, I turn the light off in the living room. That is the dogs signal it’s bedtime, and they head to the bedroom. Pepsi sleeps with me, and Hera sleeps on the floor at the foot of the bed. I know I’ve stayed up too late if I turn the light off in the living room, only to discover that Hera is already in the bedroom asleep!! Ha! Sometimes we go to bed so late that Shiloh looks at us like we are nuts when we try to take him out for one more potty break. My evening routine is not great. Watch TV for an hour with my husband, beg, bribe and beg again to get my tween to take a shower, work for a little while, Facebook and then read until way too late. I have switched to a Kindle which helps. But I did recently lose my brother so the sleepless night I guess are just part of me right now. I will work on it though, yours sounds really good. I bought a journal. It basically just stares at me right now.